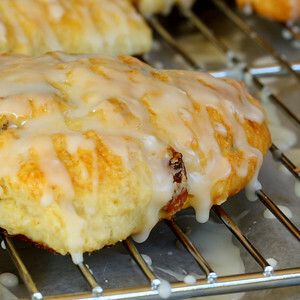 In keeping with our recent tropical theme we present Scones with Golden Raisins and a sweet tropical glaze. While I'd love to take full credit for the tropical glaze that took these scones over the top, I have to admit that it came about more out of lack of ingredients (orange or lemon juice) rather than a master plan. None the less, the Organic Trader Joe's Strawberry, Orange, Banana Juice that we substituted for the missing orange or lemon was an excellent tropical topping for these tender scones. Golden raisins add a sweetness to the dough that when combined with the tropical tasting glaze created the ideal melt in your mouth pastry. These plump golden raisins were not only organic, but locally grown and dried. Plump, pretty and bursting with flavor, these raisins are found at our Leucadia Farmers Market. I first noticed the pretty little bags, finished with a tie of raffia, a few weeks ago and purchased a bag to make Oatmeal Cookies... somehow I ended up eating the whole thing out of hand! I don't think I've ever had a raisin other than the bag of Dole raisins that comes from Costco and I was quite surprised at the amount of flavor bursting from each one. Mixed into our scone pastry dough these tasty raisins perfectly complemented the sweet, Strawberry Orange Banana glaze that topped the finished goods. Perfect with your morning cup of coffee, or as Liv used them, as breakfast on the run on your way to school, these treats are a bright start to your day! Preheat oven to 400º and line a baking sheet with a silicone mat or spray with cooking spray. In the bowl of a stand mixer add the flour, sugar, baking powder, salt and zest. Add the cold butter and mix on low until the butter chunks are the size of small peas. Combine the eggs and milk and whisk to combine. Slowly add the egg mixture to the flour mixture, beating on low speed just until almost combined. Add the raisins and continue mixing just until combined. Do not overmix! Pour the sticky dough out onto a well floured work sufrace and pat or roll the dough to a ¾ to 1 inch thickness. Using a knife or pizza cutter, cut the dough into the desired shapes and place on the prepared baking sheet. Whisk the egg and milk together and brush the top of the scones. Sprinkle with sugar. Place into the oven and bake for 25 - 30 minutes, or until lightly browned and fully baked. The scones should be firm to the touch. Whisk the powdered sugar and juice together until smooth. 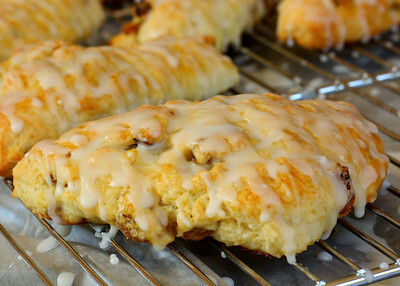 Allow the scones to cool for about 15 minutes and drizzle with some of the glaze. After the scones have fully cooled drizzle with more glaze. Sometimes substitutions make it better, love this recipe! What a neat idea to use the TJ's juice to sub for the orange and lemon. I bet these were great. And I would definitely add the raisins, too. Yum! Lately you make me drool every time I look at one your recipe and pictures. We love scones in these house! I think that juice was a great call. The entire flavor combination sounds perfect. MMM the glaze makes them even better. It REALLY adds to the sweetness! Thank goodness it worked in your favor! Excellent job! Your scones look beautiful and so delicious! Yesterday was a scone day for me too! Yours look wonderful, I love the tropical glaze. I use TJ's orange, peach, and mango juice for drinks and to put in baked goods. I'll have to make these scones! I like the addition of raisins in the scones. It made the whole thing more delicious. Thanks for sharing.